The sun is setting at the Bulgarian border village of Golyam Devrent. A trio of locals has gathered outside a small store to drink beer. White stucco houses with terracotta-tiled roofs, many abandoned, turn golden in the autumn light. This seemingly quiet village is now one of the busiest places for irregular border crossings from Turkey. Smugglers on the Turkish side drop people close to the border from where they set-off through dense forest and over a small mountain until they reach Bulgaria, and the European Union (EU). Last week the Bulgarian authorities began preparing for construction of a five million leva (US$3.4 million border) fence near Golyam Devrent in order to prevent these crossings. The fence will cover 30km of the 280km border. The new barrier is a reaction to the growing number of migrants and asylum seekers arriving in Bulgaria, most of them from Syria. But civil society groups, including the Bulgarian Helsinki Committee, have criticized the construction of a fence: “Such an attempt to stop asylum seekers from entering the country is deeply inhumane”, they wrote in a recent report. Whereas in the past only a handful of new migrants and asylum seekers arrived in Bulgaria each day, that number has shot up in recent months to 80-100. Arrivals in 2013 are projected to exceed 11,000. A key reason for the increase is thought to be a fence built along EU neighbour Greece’s border with Turkey in 2012. Over 8,700 people have crossed into Bulgaria so far this year, most through villages like Golyam Devrent where surveillance is limited. Grozio Georgiev, 67, a tree-cutter and retired border guard from Golyam Devrent, reports seeing migrants nearly every day. This week on just one day, 11 people crossed in front of his house, five or six of them small children. Many of them are sick, wet and thirsty, he said. “We offer them water and cookies, but usually they only accept water,” he said. Two weeks ago nearly 100 people arrived in the village in one day. “We never expected that number of people to cross the border,” he said. Some of them want to be caught, while others want to continue their journey. “No police, taxi, Sofi, Sofi,” they sometimes say hoping to get to the capital. “So I call the border police and say, 'We need a taxi for Sofia’,” said Georgiev, chuckling at his joke. Her next-door neighbour, pensioner Yana Petrova, 59, lives on just 47 leva ($33) per month and depends on her sons to pay her utility bills. “It's impossible” to live on that money, she says. Rumours spread that each asylum seeker received 1,084 leva ($758), but Bulgaria Deputy Minister of the Interior Vasil Marinov explained that most of that is spent on administrative costs and accommodation. In fact, registered asylum seekers receive just 65 leva ($45) per month while waiting for their status to be determined, barely enough to pay for food and basic expenses. Daniel Dechev, director of surveillance for the Bulgarian border patrol demonstrates how an integrated system of sensors and cameras helps detect irregular border crossings, enabling police to apprehend people. After sundown, two Bulgarian border police officers stand next to their 4x4 in the centre of Golyam Devrent. One of them uses night vision binoculars to scan the forest, tracing the dirt track that snakes its way towards the Turkish border. Halfway up the hill lie the remnants of a Communist-era fence built to stop Bulgarians escaping from the Soviet bloc. Further up, construction crews recently began preparing for the construction of the new border fence. This month Bulgaria requested an additional six million euros ($8,132,862) from the EU to cope with an influx of refugees, in addition to the money it already received for border security. Furthermore, FRONTEX, the EU border agency, sent Bulgaria more than 20 employees who operate alongside Bulgarian border patrol teams. At the Elhovo border police station, about 20km west of Golyam Dervent, officials monitor security cameras that show pictures of the areas near the Lesovo border crossing. 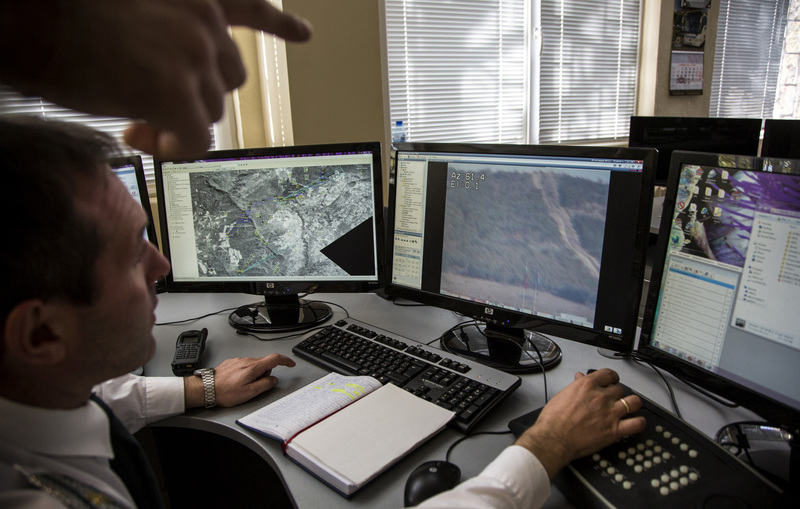 The “integrated” surveillance system uses radar and thermal video cameras to scan 58km of the border at areas either side of official crossings, says Dimiter Ivanov, regional coordinator for the border police. Currently there are six stationary observation posts using radar and live cameras, 47 small cameras and five mobile surveillance stations, in addition to mobile border patrol groups, according to Daniel Dechev, chief of the border police surveillance department. He demonstrated how the radar locks on moving objects and then the video camera automatically zooms in. In an archived video from 8am that morning, migrants can be seen as dark spots on the black and white infrared display following a dirt road on the Bulgarian side of the border. The EU has been helping Bulgaria beef up border security for several years through a fund called the “Schengen Instrument” that helps to purchase surveillance helicopters and other specialized equipment. Dechev says that once migrants are spotted, border patrol teams are dispatched to the location. On the video, a police jeep passes by the migrants. “They've missed the group, but on the radio they've been informed so they are going to go back to intercept them,” said Dechev. Those picked up are brought to the Elhovo border police station, where they are registered and detained until they can be sent on to detention or reception centres. When IRIN visited there were 501 people being detained at the police compound, double its capacity. Of the 50 registered the previous day, 32 were Syrian. Others come from Afghanistan, Iraq, as well as several African countries. Of the more than 8,000 arrivals this year, the largest number were Syrians, followed by Afghans, Algerians, Malians, Ghanaians and Somalis. Inside the police compound, tired-looking new arrivals wait inside a roped area in front of the registration centre. Later they line up to be fingerprinted, photographed and entered into the EU's Eurodac system which is used to identify asylum seekers and persons caught irregularly crossing of an external EU border. After being examined by medical staff, they are directed to accommodation areas inside the police compound. Because of overcrowding, a gymnasium is being used to accommodate men, while women and children stay in a separate area. During the day families can meet inside the centre. Though by law they should only stay at the police station for 24 hours, some reported staying up to 10 days. "There's no money, no food and we are hungry. If we don't have money we don't eat. We sleep on the floor and we are cold since we don't all have mattresses." According to Ivanov, the border police official, the prolonged stays are due to the government’s lack of space at reception centres. The gymnasium has been divided by wire fencing into four large cells, each one for more than 50 people. Inside, some people rest on the floor or on thin mattresses while others play cards or care for children. Many complained to IRIN of a lack of food, bedding, bathing facilities and proper toilets. “There's no money, no food and we are hungry. If we don't have money we don't eat. We sleep on the floor and we are cold since we don't all have mattresses,” said Atallah Kabel, 17, who fled the war in Syria’s largest city, Aleppo, adding that he had been at the police station for four days. From the police station they are eventually moved to a distribution centre, where administrators from the State Agency for Refugees interview them and determine if they are to be sent to reception centres for asylum seekers or to detention facilities for irregular migrants. “They treat us like prisoners,” said another asylum seeker from Syria detained at the Elhovo border police station.